When I was a child, no more than nine, we traveled to Mexico often. It was there that I became fascinated with the sea. I trekked down the sandy beaches, and climbed the jagged rocks around this big, blue beauty, always wondering what secrets it held. I played in the shallow waves at the shoreline, and studied hermit crabs and snails. I felt the different textures of the seaweed that washed onto the beach and I never grew tired of any of it. I cried for fallen dolphins and sea lions, when they washed onto the shore, and I always dreamed what their existence must have been like, deep in the mysterious waters. One evening we went to the beach, nothing new really. I never would have imagined the phenomenon that I would experience. The waves were glowing florescent blue, radiating a positively striking light. I ran ahead, heart beating like a drum in my excitement and awe of what I was seeing. When I reached the wet sand, I left tiny glowing footprints, the same bright blue as the waves. Even as a child, I was so moved by the majesty and splendor of the ocean, especially this night that I cried as I watched my glowing path and the bright waves crashing down. this was the night that I fell in love with the ocean. My dad brought me an empty jar so that I could save some of the sand. I filled it to the top and planned to investigate it the following day. Sadly, when I went to do just that, the glowing blue was gone and no amount of water or pressure would bring it back. I thought about that night for years, dreamt of vibrant blue sand and waves, but I never knew what had caused such an amazing sight. I was lucky enough in my sophomore year in high school to take an Oceanography class with a great teacher. I told him my story and he immediately mentioned bioluminescence. 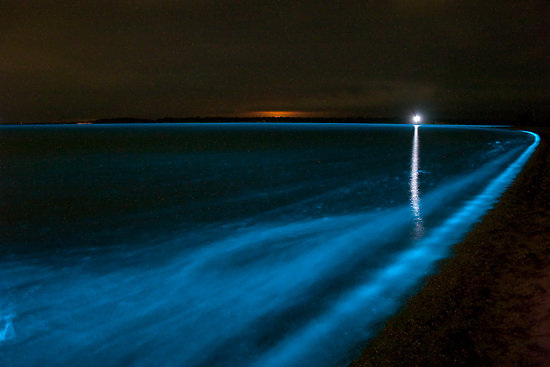 He went on to explain that the phenomenon that I had witnessed was likely due to tiny dinoflagellate called Noctiluca scintillans or the “Sea Sparkle”. Bioluminescence is such a beautiful and fascinating subject, to this day I continue to read up on it and hope that I’ll be able to witness the glowing waves again some day.